This is what the Daily Mail website now looks like on my computer. Let me explain. It’s hard to avoid the Daily Mail. Even if you’d never choose to buy a copy, links to its website are everywhere (except this post, obviously). Some are easy to spot and avoid, but when one is obfuscated by link shortening services – particularly common on Twitter, for obvious reasons – it’s all to easy to visit Mail Online unintentionally. And this is bad for two reasons: it’ll make you very angry or upset*, and it helps to bolster the newspaper’s website stats and online advert impressions. My solution involves kittens. All the best solutions do. 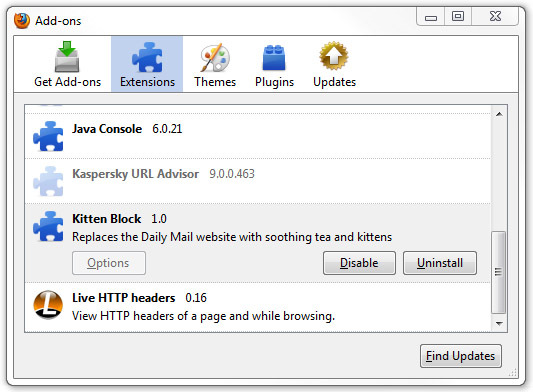 If you click on a link – shortened, full or whatever – to either site the extension intercepts it and redirects you to a special page on www.teaandkittens.co.uk, as pictured above. The extension can of course be disabled or removed. It’s free, obviously – the code that makes it tick is mostly cobbled together from snippets on the Mozilla Developer Hub site, so I take no real credit – and anyone’s welcome to edit, reuse or improve it. Kitten Block has been tested on Firefox 3.6 under Windows, but use it at your own risk – please let me know if you spot any bugs, problems etc. You can get it from the Mozilla Addons site, here. UPDATE: Kitten Block version 1.1 is now up on the Mozilla Addons site. It includes support for Firefox 4 Beta (up to 4.0b7), optimised code (shorter, smarter, redesigned to prevent incompatibility with other addons) and – very excitingly – a new kitten icon. UPDATE 2: Now also available for Chrome! What could be better! My kittens certainly approve! Any chance this extension could be ported to Chrome? It’d save me a lot of ire. very nice. I run a site with similar intentions (reduce their hits/ad revenue) but you can still view their articles. Mind if I cannibalise your extension to run mailonline links through my proxy? Hello – a colleague pointed out your site just the other day as it happens. And sure, if you want to adapt the code into something similar for your proxy, go for it – should be a very simple change. Thank you very much, I’ll stick a credit to your original extension on my site also. 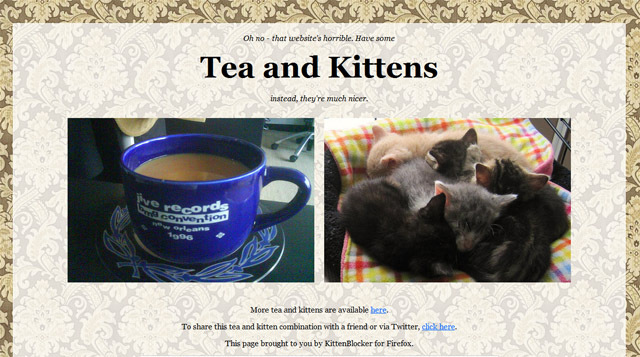 I just love tea and kittens so much. Not having any kittens of my own, I took a photo of my lovely cup of tea in the hope of sharing it with other happy tea and kittens fans. I would make me happy if you added to your site, consider it a controbution of support. I do hope you like it. Hey Tom, I’ve installed the Firefox, Chrome and Safari kittenator. My computer is safe now, but the iOS devices aren’t, is there a way to install Kitten Block on Mobile Safari? I hope Apple aren’t being bums about it. Has anyone created it yet? I’m afraid Apple doesn’t allow plugins for mobile Safari :( I think the Firefox version might work on Mobile Firefox for Android, but there’s no way to install the blocker for iOS. Sorry! any chance of an Opera port? I’m using this addon for Chrome, and I love it so much.